The Boys' New Trailer Asks "How Do You Spank a Superhero?" Later this summer, Garth Ennis and Darick Robertson’s infamously dark and comedic superhero comic, The Boys, will finally get its live-action adaptation. It’s definitely not like any other superhero show out there, and it’s not even about superheroes. Instead it’s about a team designed to take down superheroes who get out of line. 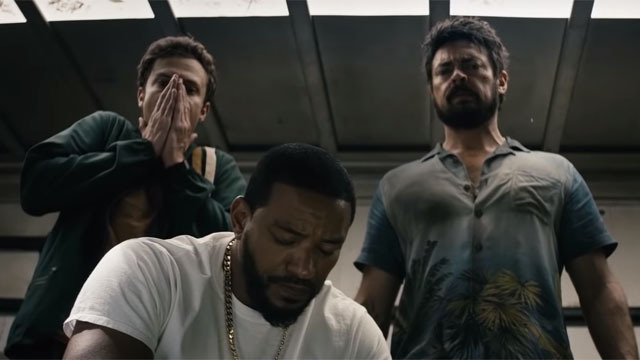 Amazon Prime has dropped a new teaser trailer for The Boys, which features Billy Butcher (Karl Urban) explaining the group’s purpose to “Wee” Hughie Campbell (Jack Quaid). Billy tells Hughie that the Boys are supposed to “spank” heroes to keep them in check. Because in this world, superheroes are more popular than celebrities and essentially treated like gods. However, not all of them are worthy of their super powers, and the Boys are particularly wary about The Seven, a Justice League-like team glimpsed in the trailer. The Boys don’t directly confront The Seven in the new trailer. However, it does feature a superhuman baby being used as a weapon. And that’s just a taste of the insanity to come. The Female (Karen Fukuhara), Mother’s Milk (Laz Alonso), and Frenchie (Tomer Kapon) are also on Billy’s team. The Seven are led by The Homelander (Antony Starr), and his team includes Starlight (Erin Moriarty), Queen Maeve (Dominique McElligott), A-Train (Jessie Usher) and The Deep (Chace Crawford). Supernatural creator Eric Kripke developed The Boys for television alongside Seth Rogen and Evan Goldberg. The series will premiere on July 26, only on Amazon Prime. What do you think about The Boys‘ newest trailer? Let us know in the comment section below!